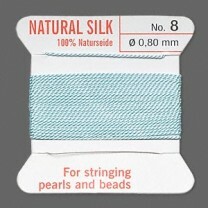 Thread, silk, turquoise blue, size #10. Sold per 2-yard card with flexible stainless steel needle integrated into one end of the thread for your stringing ease. 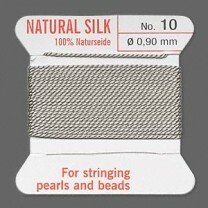 Thread, silk, grey, size #10. Sold per 2-yard card with flexible stainless steel needle integrated into one end of the thread for your stringing ease.